3DMark2001 SE is closed since 22 February 2016. Use any ASUS, Nvidia (reference) or AMD (reference) graphics card. Must use commercially / retail available components. Engineering samples are not allowed. Note: disabling cores is not allowed. Only native dual core CPUs or two single core CPUs allowed. Hyper-threading is allowed. how cool i like the stages! good luck everyone! but please make this clear "Use 2 processor core(s) in total. ", what does it mean? only core i3 allowed? or may i use 6700K and disable rest of the cores/threads? thanks! Furthermore...if i3...is the 6320 allowed with ht? Or just an i3 without ht? "Use 2 processor core(s) in total." From what I understand 6700K or other i5 are allowed if we disable cores? I think we talk about genuine dual core, Pentium or i3, no matter if with or without HT. This issue will be cleared soon, before the competition starts. I asked lewis this the other day. It's 2 core proc, not 2 core enabled total. Glad I wasn't the only one questioning this! If it were 2c enabled I would. I'm out! Has this ever been allowed in any HWBOT competition? Seems a very strange decision since aquamark scales with at least 2 gpus. After considering this, we all agreed that it would be best to limit to single GPU. The limitation has been added to the competition too. Are all ES forbidden for the competition or just Skylake ES? I have some G3258 ES can I use there for the contest? for Stage 2-3 are allowed only reference vga or even custom as Strix, Matrix etc.? only ASUS cards right? Nothing EVGA, MSi, GIGABYTE etc? is this competition only for extreme or anybody can participate in it? i can see that one enthusiast and one novice have already submitted. 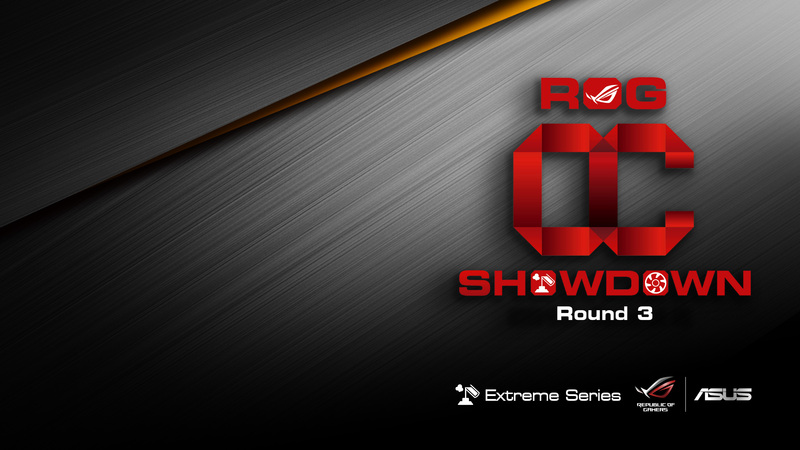 Round three of ROG OC Showdown 2015 Extreme series challenges entrants to reach the upper echelons of HWBOT.orgâ€™s Elite and Extreme leagues, reserved for the worldâ€™s most prodigious overclockers. Extreme cooling prowess will need to be engaged to secure the top scores in each of the three stages, measured with SuperPi 32M, 3DMark01 and Aquamark3. â–»Use any ASUS, Nvidia (reference) or AMD (reference) graphics card. No limitation in amount of GPUs. â–»Use 1 videocard core(s) in total. - multiple cards allowed? Strange, especially when Massman touched this few posts above mentioning "single GPU"
Ah my subs got removed because no mainboard tab. Not to worry I was going to run them again. And I have to show a SPD tab. We removed the SPD tab requirement, Pieter also made the rules more clear, it is better to keep things simple, reason for this is that AFR are retail now and we have no chance anyway to distiguish between retail purchased memory and samples on most vendors. Rules have been clarified now, if you find anything that is still not clear for you, let me know and feel free to ask. It was a nice touch to use i3 in the comp, but the recent retails are impossibly bad. Me and some others have tried to bin a decent one and they are all crap on LN2! Even the good air clockers! Anyone had "unable to parse datafile" in AM3 with i3? I suspect that running 4 dimms is the case here, I noticed that AM3 wrapper shows "16 GB <OUT OF SPEC> DIMM". Funny, because with 2 dimms it showed "Unknown Unknown" properly. Turn off sys info helps with that error. Sorry. How do the prizes work anyway? Top three elite and top three extreme or only top three overall? I have a question concerning the case of equality like lashu1919 and me, Bullshooter and junior..... What is the rule? who take the highest place? Final check done, unfortunately I had to remove a few subs due to background missing and block some due to insufficient verification. Thanks! Can you update the ranking manually? New points don't count for the total. Stages are correct but total is still incorrect (points don't add up to correct sum and ranking). Has there been any up date on the lucky draw winners and prize distribution?